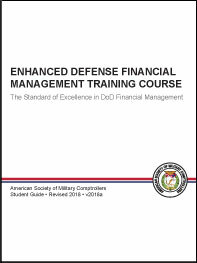 Description: The 2018 Enhanced Defense Financial Management Training Course (EDFMTC) textbook provides a broad overview (spanning in intensity from the intermediate to the advanced level) of DoD financial management. The textbook is organized into 3 modules that correspond to the new CDFM exam modules and knowledge areas: Module 1 - Resource Management Environment, Module 2 - Budget & Cost Analysis, and Module 3 - Accounting & Finance. The coordinating CDFM exams (new exams) will be available starting September 1, 2018. The 2018 EDFMTC textbook is 574 pages and also comes with an answer key and an excerpt from the FY 2019 Budget Concepts and Budget Process. Currently, only hard-copy format is available, printed on three-hole punched loose leaf paper and sent with a three-ring binder. 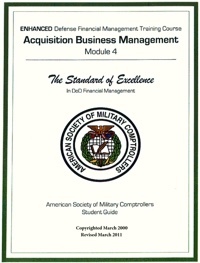 Description: The Acquisition Business Management Textbook provides an overview of the rules governing the acquisition of major defense systems and is the same textbook used in ASMC's two-day Acquisition Business Management Course. The textbook chapters correspond to the CDFM Module 4 exam knowledge areas. Currently, only hard-copy format is available.